A contemporary of Chaucer, Robert of Ripon, a Benedictine monk and sub-prior of Durham cathedral, wrote sermons which could be seen as the other side of the coin of late medieval English literature. His ponderous works use homely comparisons to condemn ordinary sinners and those who erred more dramatically, such as the Lollards. The big issue in his day was the 'anti-pope' at Avignon. Robert of Ripon's take on it was that the anti-pope was most definitely the Anti-Christ. His sixty-six sermons 'On Time and Holiness' are contained in this manuscript, which was probably made during his lifetime at Durham. 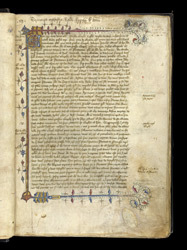 A librarian of Durham inscribed the author's name and title of the work in the top margin of the manuscript's first page. Notes on the sermon have been inscribed in the margin. Despite the stern nature of the material, the page has been decorated with conventional contemporary ornament.